Everyone has their own opinion, experience, take on them. A boundary is not a bad thing. It’s not evil. Having healthy boundaries doesn’t make us aggressive. Boundaries don’t make us rigid or unapproachable. I wrote about boundaries a little over a year ago in Business Boundaries to Protect What Matters (check it out here), yet I felt compelled to circle back around and talk more about this hot topic. Nearly every single business person I work with and speak to tells me that boundaries are impacting their business, what appears to be, at greater speeds and with larger impact. Usually, this is due to a lack of boundaries. As entrepreneurs, we often avoid and don’t maintain boundaries because we don’t fully understand what they are or how to use them. We tend to look at a boundary as a vertical gate that comes down smashing in front of us that says, “You can’t come near me and I can’t go near you …I have a boundary.” It’s a hard line in the sand, a solid wall slamming between us, BOOM! It’s clear, obvious, hard and divisive. It has negative connotations. That’s what many of us tend to think of when we think of a boundary, and it’s why we don’t like them … because they exclude people,. They exclude us from being with people, or energy or relationships. It feels awful, selfish, and hard to be on the other side of that boundary. I’d like to offer another, different perspective. 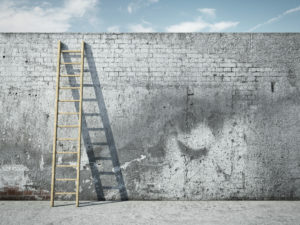 The way I think of a boundary is more like a step-ladder, that “thing” that’s going to help intentionally and confidently lift/move you to the next level, the next tier, a very important component that accelerates the growth to where you want to go and grow to in your business. Envision yourself high up on the ladder, keeping your eye on the prize and climbing towards your goals. Up there with you are the people who rely on you, your family, your team, your business, your community. And the boundary is if we bend down to accommodate someone else’s priority and do what it is they’re asking or ‘needing’ of us, then guess what happens? The ladder is going to fall over, and the people relying on us (ourselves included) are all going to come toppling down as we bend and break the boundary. When we step down to accommodate someone else’s agenda and priority, we take our eye off the prize of what it is we’re working so damn hard for. It impacts our growth, our success, our bottom line, our team, and our relationships … and quite often, our self-confidence. The boundary is there so we don’t break our back or topple the ladder and everyone relying on us feels the effects too. It’s inclusive and empowering, instead of divisive and disempowering. And here’s the thing, when we lack boundaries, we often feel resentment, frustration, and anger and this it drains our energy and vitality. A lack of boundaries can make us feel scattered and eats away at healthy relationships with family, friends, co-workers, employees, or even (perhaps especially) with ourselves and our business. And, with boundaries come a sweet little (well, HUGE) perk: work-life balance. When we have boundaries without apology, we simply get more done in less time and we can gain our life back. We can begin to enjoy again the things that are important to us, the things that drew us into business in the first place. Freedom, family, wealth, impact, and more fulfillment in each and every day. In my 27 years as a business owner, and through my work with many business owners in my coaching career, I’ve identified 4 key categories in our business that we need to be hyper-focused on when it comes to boundaries so that we can build the business of our dreams and live the life we want to experience. They are vision, roadmap, time management, and team. Let’s take a look. But over time you had to bend because this person needed you, that person needed you, and the kids constantly needed rides to school, games, to friends’ houses. A clear vision of where we want our business to go and grow to, allows us to confidently set boundaries and unapologetically say no to the things that aren’t moving us closer to our goals. And sometimes, those things might be something that we really want to do, but the payoff/tradeoff is so much sweeter knowing in the long run our short-term choice supports our long-term vision. A business plan isn’t just for banks and it’s NOT boring. It’s actually there to keep us on track so we can MAKE MONEY (a good thing, right?)! 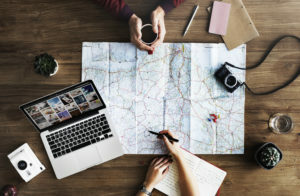 You probably had a clear plan, a roadmap, at some point but employees came and went, a vendor didn’t pull through for an important job, a big client decided they were going in a different direction, and now all of a sudden your roadmap is GPS on haywire. Nothing or little makes sense anymore, and you’ve become reactive instead of proactive. This is when you’re in the biggest jeopardy of falling off the ladder … you’re spinning 50 plates in the air, working on deadlines, trying to coordinate employee schedules, family schedules, negotiating a new contract, (fitting in some self-care), and a veritable plethora of To-Dos. It feels more like putting out fires than following your vision. I know, I get it, I’ve been there. Being in reactive mode involves constantly bending down from your ladder to accommodate somebody else’s agenda and priorities. Taking your eye off YOUR vision and goals, and ignoring the boundaries you need to achieve your vision. Your roadmap is what takes your Big Vision and strategically gets you into motion … it’s what creates a solid path to follow and solid boundaries that say “NO,” confidently, intentionally, and without apology. Schedule some time to reconnect to your vision, to your goals for what you want your business AND life to be. Then back out of your vision to create a roadmap that supports you, defines your choices, and cut the edges in for strong boundaries, and for your success. Many of my clients and colleagues, tell me they don’t have the luxury of slowing down to get clear, to reconnect. That’s like driving down the highway at top speed and saying you don’t have time to stop for gas. It seems pretty straightforward. We’re all aware of it. While it’s an easy concept, it’s really, really challenging in healthy execution. It’s TIME MANAGEMENT. This is the thing we all have a finite amount of. We only get 1 “noon” on Tuesday this week, ever. And, here’s the kicker: none of us knows what that finite number is. We’re operating a budget (our budget of time) with no fiscal transparency. Yet we behave like there’s always tomorrow. Time Management isn’t really about time blocking, setting reminders, and finding 30 minutes to check our e-mail. There IS VALUE to all of that, absolutely. BUT, just coming in and “Managing Our Time” kind of feels like a time out, doesn’t it? Time Management is about tying it all together…what’s the VISION? HOW are you getting there? WHAT’S your roadmap look like? WHEN are you moving things forward? Actual TIME MANAGEMENT IS THE RESULT OF having a SOLID PLAN. The plan is the result of having a VISION you’re really excited about. Our days are our life in miniature. Be vigilant with your time. Use the law of linkage when someone is asking, or needing, you to step down from your ladder and not honor your boundaries. Link every choice you make today to your vision of the future you’re working so damn hard for. THIS will allow you to say “no” and take things off your To-Do list, without apology. Team. It’s the people, business AND personal. It’s the WHO. Your team is who’s supporting you, AND who’s not … and where are the boundaries drawn? An employee coming in late all the time. THAT is a boundary issue. Your team being reactive instead of proactive—where is your team? When YOU’RE coming in early and working late. THIS IS A BOUNDARY ISSUE. It’s not delegating work you could be handing off because you don’t trust your team. This is a boundary issue … as well as a delegation and communication issue, but those are for another discussion. It’s dropping what you’re working on and running your kids all over town, for the third time this week. That’s a boundary issue. Team is how we ACHIEVE more without DOING more. One of the biggest problems I see with the businesses I work with is they’re taking on too much, and in turn their schedule is overloaded, they’re overwhelmed … and they’re moving in reactive mode. Be sure to have a competent team that you trust and that can handle the work you’re bringing in … or else if you’re saying “yes” to too many things YOU’LL be consumed 24/7 figuring out how to make it all work. And THAT’S a boundary issue. Could your boundaries use some updating with your team? Be transparent. Let them know what’s working and what’s not. Invite them into the conversation of what your vision is. Share your roadmap. Ask them where they feel they can best contribute and what are their strengths? We can’t do this alone. A team is what will support us and uplift us. Together we’re stronger (I know, I know, the dramatic music plays here, roll with me…) because it’s true. Lift your head, look around, who’s your tribe? Who are your power partners? Healthy boundaries are what make that happen. WITHOUT APOLOGY. Thinking of this area, when did I last feel amazing/supported/etc.? What’s ONE THING you can do differently, today? THIS is slowing down without losing momentum…working ON your business. It’s focusing on you, it’s focusing on your business….you’re just not doing it at your normal 150 MPH! I’d love to hear how boundaries have supported you in achieving your dreams, leave a comment below.